Congratulations to Andrew Robb, originally from Edinburgh, who has just won first prize in the jazz bass competition at BASS2018 LUCCA, the sixth European Bass Congress. All the events of this year's congress took place within the medieval walls "Le Mura" of the city of Lucca. The jury comprised of Adam Booker, (USA) Wayne Darling (USA/Austria) and Furio Di Castri (Italy). Andrew Robb was born and grew up in Edinburgh, where he attended George Heriot’s School and St Mary’s Music School. He led the double bass section of the (classical) National Youth Orchestra of Scotland. He did a Bmus in Jazz at The Guildhall School. He won the BBC Radio Scotland Young Jazz Musician of the Year in 2009. 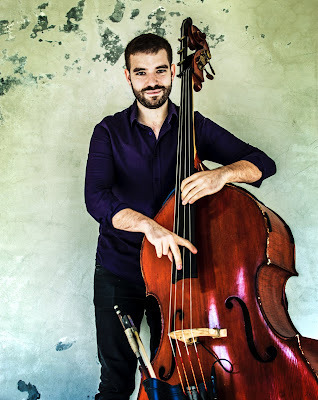 He is a member of (fellow St Mary's former pupil) Alan Benzie’s piano Trio - (their CD Little Mysteries won album of the year at the Scottish Jazz Awards this year), of Henry Spencer’s Juncture, and Renato D’Aiello’s Quartet. He also has a short tour of Scotland coming up next month with Norwegian guitarist Bjørn Solli.